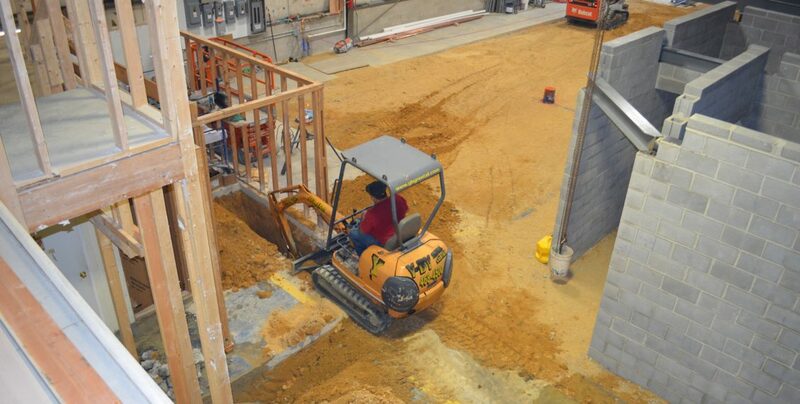 This past month we had all the trenches dug within the building for the sanitary sewer. We employed two types of materials that will insure that the sanitary sewer piping will withstand years of use without an issue. Our plumber has been consistently laying pipe for the first floor Tasting Area, the brewery laboratory, and the new restrooms. Early in the month they completed the connection to the pipe that leads to the connection in the street with dual cleanouts. The block walls and steel support structure was completed for the mechanical mezzanine which will hold our boiler room, grain storage and cracking area, air compressor, electrical panel and step down electrical transformer. There will also be a specialty grain room for storage of those extra special grains. A few surprise features are also included on this level. The electrician has been busy with about two thirds of the electrical distribution infrastructure completed. This required new electrical circuit breaker panels, of which two of the three are installed, along with one step down electrical transformer. A third circuit breaker panel and another transformer are currently under way. The well that reaches down to the 800′ Sands has been running all month and is completely operational. We also had the city water meter installed late in the month, so we have both water supplies up and running. Final demolition has almost been completed for the lower mezzanine Tasting Area. Construction should begin there by the end of the month. Items to look forward to next month will include the floor pouring on the mechanical mezzanine; creation of the boiler room, specialty grain room and the other enclosed area. The setting of the steam boiler, mill and air compressor along with the electrical transformer should all land on place in March. The brewery floor should also be poured covering up all of our new specialty plumbing. More to come soon!